BPD hidden sectors should not be zero for a hard-disk partition boot sector. Whatever that means and from wherever it had come had happened immediately following the initial part of a Win7 installation after I had failed to remember to not let Win7 do the partitioning. I had told Win7 to give itself a partition of a certain size, and then I goofed by not cancelling the installation and doing my own formatting first after it said it would be adding a small (UEFI?) partition at that same time. I know nothing about UEFI, but I have read about some older systems (such as mine?) not being compatible with it. In days past, some similar troubles came along for me during the Win7 Service Pack update for an older installation although that did not hurt me as badly since I did not have Win7 on my first drive at that time and it cannot do anything with its boot loader unless it is. Still looking for a solution here, and Windows 7 is still the culprit. Following another recent Win7 update, something has again been done to my boot drive and now my ntldr for XP only works every other time -- see more below* -- whenever I select XP either from the Win7 Menu or directly from boot.ini after using Grub4Dos from a stick to skip bootmgr and go there directly. *The interesting thing here is that I get a "Disk Configuration Error" message every *first* time (such as from a cold start) when I try to boot into XP, but then a "Return" is all it takes to reboot and then XP comes up just fine. I did not have that problem again until after this most-recent Win7 update. Also, and for whatever bit of insight this might offer: Win7 even messed up my Win98 startup floppy in this same kind of way some time ago when I had forgotten the floppy was still in the drive. Fixing that was as simple as reformatting the floppy and making a fresh Win98 startup, but that same kind of effort does not work with a hard drive after Win7 has done whatever it has done to "take over" as "number one" or whatever. First off Windows 7 can not set boot order. That can only be done in the bios. With a dual boot system Windows can give a option screen so you can choose what Operating System you boot into. Install your drives and then do this tutorial by Golden. It will give us some idea of what we are working with. 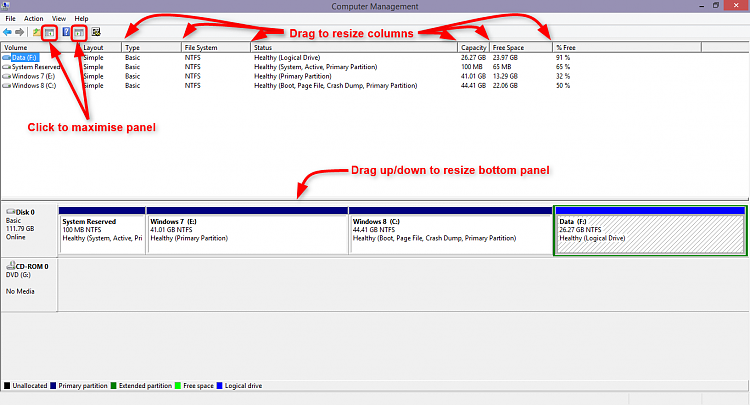 Also let us know what is installed on what partition. Could be very helpful. Understood, and the problem here is not about boot order. The problem here is that Win7 has somehow made it impossible to ignore, jump past or overwrite its MBR code pointing to bootmgr so I can go directly to ntldr and make it all the way to a running XP, if I wish. The result of my attempts to fix that have been varied, and you can see them beginning at the top of this page of this thread. Understood, and that works just fine. But now that Win7 has done whatever it has done, its own link to ntldr for XP only actually results in XP being started every other time. The first PATA ("C:") is where the first active partition appears and where ntldr is located along with bootmgr and io.sys. Then, the "X" on the first SATA (hd3) is where Win7 wrote something that is telling my machine it is to be the boot drive even though that drive has no active partition. I have managed to overwrite the initial Win7 MBR on "C:" so I can use MBR-to-ntldr there, but that only works the second time around (exactly as when trying from Win7's BCD) after my machine has apparently somehow figured out it actually should actually be booting from the first drive just as it had first been instructed by my BIOS boot order! Please post a picture exactly like the tutorial instructs you to. Lets try it again. This is what it should look like. This is from the tutorial. This is from the computer I'm on now. Don't put any thing on the picture. Just type in below the picture the requested information. We need to see the unaltered pictures. Take you time and follow the tutorial exactly. Ah, okay. I had not realized you were looking for the top part! I have several screens shots to add some overall perspective on some of the challenges of multi-booting, and I will post the most-relevant one last (the corrected one from above) since we are dealing with trying to get XP to boot without having to go around through machine startup a second time in order for that to happen successfully every time. Overall, different Windows OSs see my drives in different orders, and I do understand that should not matter as far as BIOS boot order is concerned. Nevertheless, I was able to BIOS-boot from "C:" (first active partition) on the first PATA (using either bootmgr or ntldr) and get into XP every time I wanted to go there without having to reboot to finally get there on the second try until after another Win7 update about a week or so ago again did whatever Win7 had also previously done to break that. I thought there were 4 Basic partitions limit? or am I confusing? Guess I am confusing with primary partitions. Boot Windows 7/8 from GPT on BIOS system : No hybrid MBRs or DUET!